In this project we develop hierarchical probabilistic representations for modeling activities of people. We describe how to use our representation to do sensing, learning, and inference at multiple levels of temporal granularity and abstraction. The approach centers on the use of a Layered Hidden Markov Models (LHMMs), using parameters that are learned from data. LHMMs provide a robust means for modeling diverse human activities. We illustrate the application of LHMMs within an office-awareness situation. We describe the ability to correctly classify in real-time typical office activities such as talking on the phone, being in a meeting with someone else, giving a presentation or just performing work within an office setting. 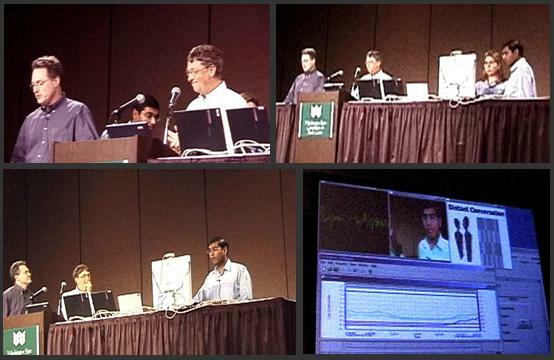 Images from SEER debut at keynote presentation by Bill Gates, IJCAI 2001. After Eric Horvitz presents Priorities, he introduces Nuria Oliver and Ashutosh Garg for a demonstration of the SEER context-sensing system. Proceedings of Int. Conf. on Multimodal Interfaces (ICMI'03). Vancouver, CA. Nov 2003.